Elderly people are not receiving the medical care they need, according to a study. Researchers say they have found evidence to suggest the care provided by GPs to patients over the age of 65 is "inadequate". They say many patients are being denied basic check-ups while others are given medication they do not need. Their study suggests people living in nursing homes are more likely to get poor care from their GP than those living at home. The findings are based on a study of 698 elderly patients from four practices in Bristol. Of these, 172 were in nursing homes and 526 were living at home. The researchers found that overall just three out of four elderly people had been offered the flu vaccine during the past year. Of those with heart disease, just two out of five were prescribed recommended beta blocker drugs. Just two thirds were prescribed aspirin which has been shown to help people with heart problems. They also found that people in nursing homes were less likely to have had their blood pressure checked during the past year. Similarly, those patients with diabetes were less likely to have a full check-up if they lived in a nursing home. The study also found that nursing home patients were more likely to be taking tranquilizers and laxatives. The researchers, led by Professor Tom Fahey of the University of Dundee, said their findings showed that elderly people were receiving inadequate care. Writing in the British Medical Journal, they said this ranged from "insufficient use of beneficial drugs; poor monitoring of chronic disease; and overuse of inappropriate or unnecessary drugs". The charity Help the Aged welcomed the study. Annie Stevenson, its policy officer, said: "Medical care for older people generally, and in care homes in particular, gives cause for profound concern." She added: "It is truly horrifying that sick older people can be treated in this way and a measure of how far we have to go to root out age discrimination in health care." Opposition parties urge the government to act on the findings. Shadow health minister Simon Burns said: "The Report's findings are alarming and worrying. 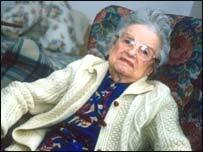 The elderly have a right to expect high standards of care, dignity and security, in their latter years." Paul Burstow, Liberal Democrats' spokesman for older people, said: "Over-medication can cause premature death, and it can deny people their dignity, turning them into zombies. "With serious shortages of investment and little chance of attracting more, nursing homes are turning to the chemical cosh to make residents easier to manage." He added: "The government has failed to heed the warnings and take the action that would save lives and improve the quality of life for thousands of vulnerable older people." The government has pledged to look at the findings. A spokeswoman for the Department of Health said care homes were regularly and thoroughly inspected by the National Care Standards Commission. "It is the job of the NCSC to challenge inappropriate care or lack of care and to require improvements. Homes may be closed where they fail to comply with the regulations governing the running of the home." The Independent Healthcare Association said the study highlighted failings in the care provided by GPs. Barry Hassell, its chief executive, said: "Ongoing medical care of care home residents is the responsibility of the resident's GP. Care homes cannot prescribe drugs only the responsible medical practitioner can do this."